Emma Lazarus called “The New Colossus”? We know, of course, that this is more of an ideal, and that throughout our nation's history, such opportunities were not always available to those who wanted to make the United States their new home. Over the past two centuries, immigrants have faced numerous obstacles that have hindered such efforts. The ease or difficulty of this endeavor often depended on economics and the political climate in the U.S., and on the laws passed by the government that often reflected the mood of the nation. Understanding these laws, the state of the nation and the world during these times, while keeping in mind the dates of our ancestors’ immigration, will allow us to imagine what might have gone into their thinking as they weighed their decision on whether or not, and if so how, to emigrate. By having some knowledge on these matters, and by being empathetic, history can become more real and more relevant to us, and just perhaps this will enable us to see our immigrant ancestors in a slightly different and truer light. With the exception of the Native American Indian, the United States began and was formed as a nation of immigrants. The first immigrants were generally white, with a fair complexion and facial features. Most were from the countries of Northern Europe, i.e. England, Germany, and the Netherlands. Twenty percent of the population of Colonial America was made up of African Americans, i.e. mostly slaves. From early in the 17th century through the first half of the 19th century, most of the immigrants were from either Western or Northern Europe. There was little in the way of federal legislation regarding immigration during this time. In 1798, the Alien and Sedition Act was passed, which allowed for the deporting of any foreigner who was deemed a threat to the peace and safety of the United States. Also, in order to become a citizen, a person would have to had resided here in the States for fourteen years, not five years as was the previous requirement. In 1819, with the passage of the Steerage Act, ship captains were now required for the first time to actually keep precise records of the immigrants that were sailing on their ships. Starting around 1840, immigrants began to arrive from different regions in the world. Europe was in poor shape economically and the U.S. was expanding westwards. There were great improvements made with regards to communication, i.e. telegraph and mail service got better. Even trains and steamships made travel easier. So for a time, these immigrants served the needs of a growing country. Many workers had come from both China and Japan. They worked in jobs that most others did not want and worked for low wages. They dug in mines. They helped build the railroad lines that would eventually traverse the country. They worked in laundries and became housekeepers. Even before this, beginning in the 1830s, many Irish immigrated to the U.S. In 1845, there was a great potato famine in Ireland. Ireland was very dependent on the potato to sustain its people, and because of this blight, one million Irish perished from starvation. This caused many Irish to emigrate in order to escape this devastation. It wasn’t yet the Jews who were the target of those nativists, the ones who had deep roots in America. It was the Irish, as well as the Italians, who were Catholic. Word was spread that they were here to spread the Pope’s influence. Many Italians had a darker skin tone than the earlier Northern European immigrants. A secret society, called the “Know Nothings,” was formed and spouted patriotism and railed against the influx of the “ignorant” foreigners, who were not as educated and superior as they were. Of course, the Chinese had it bad too. They were called the “yellow peril,” and a lot of agitation was stirred up against them too, and rioting occurred in some Western states. The Chinese were said to be a corrupting influence and were idol worshippers. Now that they were no longer needed for their cheap labor, e.g. in building the trans-continental railroad lines, they were vilified. There was a growing sentiment that all of these new immigrants would take away jobs from those already here. There was also, without a doubt, an underlying racism among many. In 1862, Congress passed a law that restricted Chinese immigration (they were called “coolies”), prohibiting vessels registered in the United States from transporting Chinese to this country. In 1870, a uniform naturalization law was passed that required at least a two-year residence in the United States before a person could become a citizen. In 1875, a federal law was passed that prohibited both prostitutes and convicts from immigrating. By 1880, there were at least 75,000 Chinese in California alone. In 1882, Congress prohibited Chinese immigration all together for at least ten years by passing the “Chinese Exclusion Act.” Also, it was even forbidden for the Chinese to become naturalized. Those that were contract laborers, i.e. those entering the U.S. employed by U.S. employers, were also excluded through the passage of the “Contract Labor Law of 1885.” American companies were forbidden from even advertising for such help. Such restrictions caused the rejection of almost 3,000 people per annum. In 1891, the federal government took over control of immigration into the United Sates. 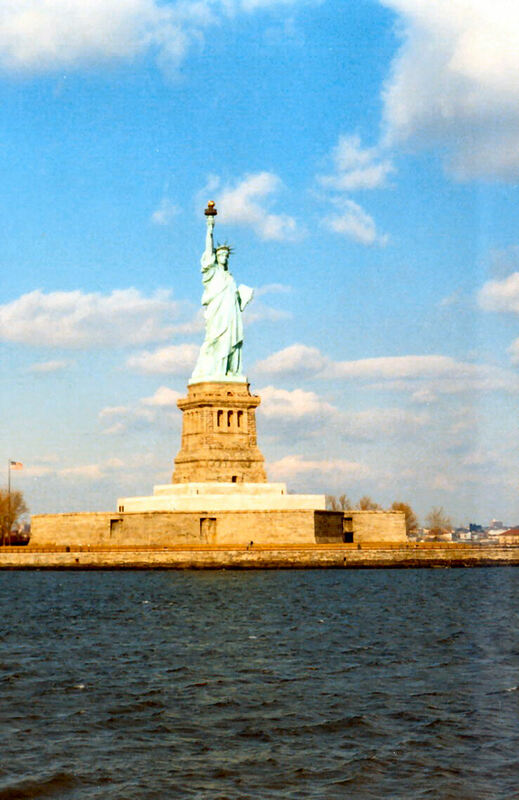 In New York, this meant that the immigration center in New York Harbor, called Castle Garden, previously run by the state, would be closed down, and Ellis Island would be built. The Congress passed laws that would affect those trying to immigrate from overseas, but did nothing to prevent anyone from crossing the borders from either Mexico or Canada. Once the purview of the state, the government now assumed the burden of providing services for the new immigrant. The laws that were passed in this year by the government sought to keep out those who did not meet a minimum health requirement. If a person was suffering from a “loathsome or dangerous contagious disease,” they were turned away, and returned to where they began their voyage. The arriving, potential immigrant would have to prove that they would not become a public charge. Other events, besides the stricter immigration laws, had the same effect. There was a cholera scare in 1892, and a financial crisis in 1893, which lead to years of a depression in the U.S. economy. This all caused a dwindling in the numbers that immigrated. The sentiment toward immigration was becoming increasingly negative, and a call for even more restrictions and regulations was being made. In 1901 President McKinley was assassinated. Following this catastrophic event for the nation, the U.S. government, in 1903, consolidated their immigration laws, adding polygamists and political radicals such as anarchists, subversives to their exclusion list. In 1907, an agreement was made between the governments of the United States and Japan that no passports would be issued to any Japanese that wished to come to the U.S. to work as a laborer. In this way, the United States would not have to turn them away when they tried to immigrate. In 1917, due to pressures put on it by such groups as the Immigration Restriction League, Congress passed a law that would require that all potential immigrants over sixteen years of age pass a literacy test if they wanted to be admitted. Asians were affected too. They could be turned away if they didn’t meet certain mental, moral, physical and economic standards. Sometime after the war, despite the literacy test and all the other imposed regulations, 800,000 people immigrated into the United States in 1921. Many of these Jews were immigrants from Southern and Eastern Europe. These immigrants were looked at as inferior, uneducated, lacking in skills, and undesirable. So due the increased anti-immigrant sentiment, the fear of those already living here possibly losing their jobs to foreigners, and a growing isolationist sentiment, Congress made it extremely difficult for people from certain regions to immigrate. A quota system was enacted, whereby the number of aliens of from any nationality could not exceed three per cent of the number of those who preceded them from that same nation, those who were already residing in the U.S. as of 1910. This was supposed to be a temporary measure that would give the Congress time to debate the issue of immigration. By 1924, the U.S. government passed “The Immigration Act of 1924,” which created a permanent quota system. This, in effect, reduced the number of immigrants of undesirable nationalities who were allowed in under the quota to less than half, to little more than 150,000. Instead of the aforementioned three percent, this number was reduced to two. Instead of using the 1910 census, they used the census from 1890. What is the significance of this? So many of the southern and eastern European immigrants, e.g. Jews, had immigrated to the United States in the period between 1890 and 1910, and thus, the number of them permitted in was greatly reduced. Whereas this new quota system decreased the quota of those from northern and western Europe by twenty-nine percent, the quota of those from southern and eastern Europe was lowered by eighty-seven percent! This, of course, favored the countries that were responsible for the country’s early immigration, e.g. England, Germany and Scandinavia. If the immigrant did satisfy the requirements for residency however, exemptions were provided for their wives and children who were living abroad. Beside all of this, those seeking entry into the U.S. had to obtain a visa from an American consul in the country from which they wanted to emigrate from. This was a way of turning away potential immigrants even before they reached our shores. It should be mentioned that these quotas only applied to those entering from abroad. The U.S. still needed cheap and plentiful labor from its neighbors, especially Mexico, to harvest its crops. In 1929, national origin was now the basis for who would be allowed in under the new quota system. Also, during this time, the Great Depression occurred, and many of those who potentially would have immigrated didn’t come; thus, most of the quotas were never satisfied. In the decade of the 1930s, more people left the United States than entered! It should be noted, importantly, that this quota system did not distinguish between those seeking to enter the United States as immigrants or as refugees. In 1939, many of those wanting to leave Nazi Germany were turned away from our shores. Who knows how many tens or hundreds of thousands of Jews would have been saved had our policy toward immigration not been so stringent? What does a person do when they cannot immigrate through normal means? If they could, they often came here illegally, perhaps buying passports, or being smuggled in, or immigrating to another country. Many Jews immigrated to Cuba, especially those from eastern Europe. Some stayed and opened up small businesses there. Many Jews from the United States, after the war involving Cuba, Spain and the United States in 1898, were already in Cuba, and had already set up businesses there. Most immigrants, though, had hoped that this would only be temporary, that eventually they would be able to enter into the United States and stay there permanently. At least if they were in Cuba they would be that much closer to the United States, and perhaps nearer to fulfilling their dream of becoming a U.S. citizen. They had hopes of somehow getting a legal visa, or if that was not possible, perhaps entering the U.S. illegally, from either Cuba itself, through Canada or through the porous borders of Mexico into one of the neighboring states, i.e. California or Texas. So, doesn’t this all give us food for thought? There were our ancestors, often living such a fragile existence in Eastern Europe, wanting to escape poverty, persecution and pogroms. During World War I, many had to run between bombs, being sandwiched in between warring nations. They certainly wanted better. Depending on the economic, social and political environment in the United States and abroad, this opportunity for a new life in a new land was often made that much more difficult. Alternative means of entry had to be found. Often, they had to wait for just the right time to emigrate. We must be grateful for those who did make it, for without them, many of us would not be living here as Americans today.